Staff Fest, the annual celebration of Emory staff members, is set for Friday, May 12, from noon to 3 p.m. on the Quad. 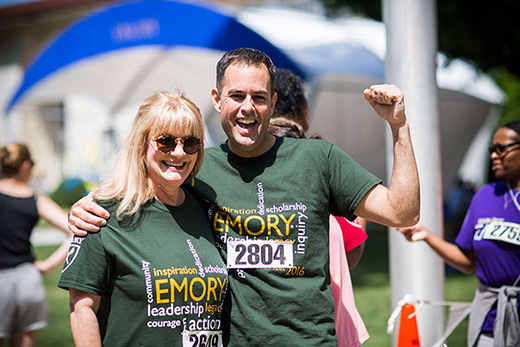 “Be Bold – Be Emory” is the theme of this year’s Staff Fest, the annual celebration of Emory staff members. Join the fun on Friday, May 12, from noon to 3 p.m. on the Quad. The theme, voted on by the Employee Council, reflects the era of change with a new president and new visions. This year’s Staff Fest also features some changes, as well as the return of favorite activities from previous years. Lunch will be provided by caterer Jim 'N Nicks, while quantities last. On the menu is a choice of chopped beef brisket or pulled chicken with barbeque baked beans, potato salad, cheddar biscuits, fresh fruit and a small dessert. A black bean burger is the vegetarian option. An assortment of Coca-Cola beverages will be available, and staffers are also encouraged to bring refillable water bottles to support Emory’s sustainability goals, an effort that began at last year’s Staff Fest. This year, those bringing water bottles are eligible for a prize drawing. Show the water bottle to a Human Resources staff at the T-shirt table and your name will be entered into the drawing. There will be additional refreshments on the Quad, including popcorn and ice cream. Because of space needed to serve lunch and provide seating options on the Quad, Information Central will not be held this year. Information Central had been comprised of booths and tables offering information by Emory’s departments, service providers and vendors. Held annually on the Friday after Commencement, Staff Fest starts with the annual Fun Run-Walk, following a two-mile course that begins at Asbury Circle and goes through campus to end on the Quad where Staff Fest festivities are held. Check in by 10:45 a.m. to start the run-walk at 11 a.m. Prizes will be awarded to top men and women in each age group, with additional opportunities for other prizes as well. If you didn't sign up by the May 10 deadline, you can still join participants along the route to cheer them on. The 2017 Staff Fest Volleyball Tourney will begin a half-hour earlier this year, at 10:30 a.m., and run until 2 p.m. Up to 20 teams will compete on two courts in these refereed games. This fierce but friendly competition always proves exciting for competitors and spectators alike. Popular returning Staff Fest activities include caricature drawings, green screen photos, a rock-climbing wall, a live DJ and dancing on the Quad. There will also be a basketball hoop, relay races, corn hole, log slammer and dancing demonstrations by two groups of Emory line dancers. Employees are reminded that the event is for current staff and retirees only. Family members will not be admitted.